Lee Sang-ki (center), president of the Journalists Association of Korea, exchanges opinions on ways how to promote journalist exchanges and cooperation with Valery Agarkov (right), deputy editor-in-chief of ITAR-Tass's Foreign Policy Department at the JAK office April 28. Korean and Russian journalism associations have agreed in principle to begin cooperative exchange programs starting this year. The agreement was made between Lee Sang-ki, president of the Journalists Association of Korea, and Valery Agarkov, deputy editor-in-chief of the Foreign Policy Department of the Russian news agency ITAR-Tass, during a visit by Agarkov to Seoul on April 28. As part of the exchange programs, Lee offered to invite several Russian journalists as observers to the 2nd East Asia Journalists Forum, to be held in October in Korea, to which Agarkov responded positively. The JAK launched the annual forum last year in Seoul, with 40 journalists from 14 countries, including observer nations like the United States, Australia and Germany. "Besides our participation in the forum, we are willing to help North Korea send its delegates to the Seoul forum, as we think the role of journalists is crucial in helping maintain peace and stability in East Asia," Agarkov said. The Russian news agency will host an international conference on Sept. 1 to mark the centennial of its founding in Moscow, for which Agarkov asked Lee to send congratulatory remarks that would be read at the conference. Tass, the state-run news agency of the former Soviet Union, was changed into ITAR-Tass in 1992. 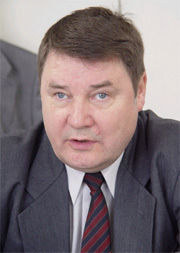 The agency has about 2,000 journalists, including correspondents in Pyongyang, Agarkov said. "So far we have tried to find out the exact situation in Korea mainly through Japanese and Chinese media organizations, but from now on we will be able to understand Korea more precisely through the JAK and the Korean media," said Agarkov, who arrived on his first visit to Korea April 22 at the invitation of the Korea Foundation. Agarkov expressed great interest in the JAK-initiated fund-raising campaign to help establish a college in North Korea, tentatively named Pyongyang Science and Technology College. The JAK has collected donations for the college since 2002, and so far has given about 25 million won ($21,000) to the North Koreans. The college is slated to open in the North Korean capital in 2005.